Novartis AG (NVS) is projected to become the biggest drugmaker in the world by 2024, according to an article published late last year by FiercePharma. But whether the honor of being No. 1 rewards the investing faithful remains to be seen. Despite being a top pharma company over the past five years, the growth of Novartis' shares has been lackluster at best. Warning! GuruFocus has detected 3 Warning Sign with NVS. Click here to check it out. 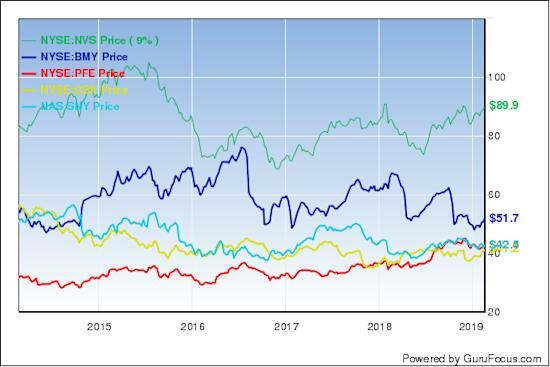 The company's stock is up a skimpy 9% since March 2014, compared with a more than 60% jump in the Dow Jones Industrial Average and well below big pharma brethren Johnson & Johnson (JNJ), Merck (MRK) and GlaxoSmithKline (GSK), among others. Novartis shareholders can take some consolation that the company outperformed Bristol-Myers Squibb (BMY) and buried Sanofi (SNY), whose shareholders saw the value of their investment clipped by 20%. Newly minted Novartis CEO Vas Narasimhan has wasted no time making changes to prepare the company for the challenges of the years ahead. The personable 43-year-old American is emphasizing the use of digitally generated data to make the company nimbler and more focused in its day-to-day operations. Narasimhan thinks data mining is essential to streamline drug testing. The company is employing a smorgasbord of digital-age tools -- including artificial intelligence, telemedicine, automation and even quantum computing -- into the labor-intensive process of inventing and testing new medicines for efficacy and safety. He points with pride to the new Novartis study operation center, which allows the company to track the hundreds of trials it runs in real time using predictive modeling to forecast outcomes, according to a mid-2018 Barron's article. "Data can provide a sustainable, competitive advantage," Narasimhan said. He thinks the tools can further improve the already outstanding record of Novartis' research and development, pointing to its success in getting compounds through the pipeline and approved. "I choose to bet on innovation ... that can deliver real breakthroughs and inflection points in valuation, rather than trying to mitigate the downside," he said about his aggressive approach. Novartis shares have recovered after being dinged Jan. 30, when the company missed by a nose projections for fourth-quarter earnings. Investors also might have been disappointed to learn the company expects sales of its main products to be up less than 10% in 2019. The changing makeup of Novartis may entice some investors. The company sold off its generic drug unit and is jettisoning eye-care subsidiary Alcon. A formidable company on its own, Alcon will be joining the Swiss Market Index of the country's 20 largest listed companies. As it climbs to the summit of Pharma Mountain, Novartis -- to use a baseball analogy -- will be more of a singles hitter instead of one that relies on the home run. That's because by 2024 the company might have only a few of its drugs ranked among the top 15 by sales. But the breadth of its offerings will enable Novartis to reach a projected $53 billion in drug sales, according to FiercePharma. Four of Novartis' pharmaceutical products topped sales of $1 billion in 2018, led by the autoimmune drug Cosentyx with more than $2.8 billion in sales. By 2024, Cosentyx is forecasted to remain the company's top seller, with projected sales tabbed at $5.5 billion. Sales of heart failure drug Entresto, which were just more than $1 billion last year, are expected to climb to more than $4.4 billion in 2024. Novartis sells at a multiple just over 16 and its dividend yields a healthy 3.3%. According to Yahoo Finance, the company has an average target price of $99, has received five consecutive analyst upgrades and is recommended as a strong buy by one of the analysts who follow the company; two others rate it a hold. Disclosure: The author holds positions in JNJ and BMY.